Black Mountain - Jackson NH and Mt. Washington Valley Area Information. Pumpkin People, Tradionally Yours Events, Lodging specials, Dining and Ski Area Info. Black Mountain, New England’s oldest operating ski area, proudly offers a timeless skiing experience. Our narrow, windy trails give you the best of New England Skiing, with all levels of terrain, and super fun glades. During spring, summer and fall, the ski area is home to Black Mountain Stables and offers a variety of wonderful equine programs. 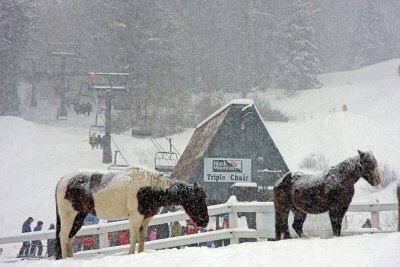 Our friendly horses and experienced trainers offer a unique riding experience riding up the ski trails for magnificent views! Black Mountain is Family Owned and Operated, and you will feel like one of the family once you stop in and enjoy.